When David Allen '65 first met Dean Alfange, Jr., he was a junior at Lafayette College, majoring in government and law. Professor Alfange was serving in his first year as assistant professor of government and law and encouraged Allen to participate in a two-year honors program. "Professor Alfange set very high standards," says Allen. "I remember when I submitted the first draft of my thesis, I had a hard time finding the black type because of his red pencil. He was just that kind of professor, which prompted me to work even harder." Allen graduated from Lafayette in 1965 and attended law school at the University of Michigan-Ann Arbor. Looking back on his Lafayette undergraduate years, he feels that the size of the College positively impacted his experience. "With only about 425 men in the class, there was an opportunity to develop close relationships with professors," explains Allen. "The fact that Dean Alfange and I have remained in contact and developed a friendship has meant a lot." This longstanding relationship with Alfange prompted David and his wife, Mary, to establish the Dean Alfange, Jr. Scholarship Fund to support students majoring in government and law at the College. The Allens established the fund with a qualified charitable distribution from their IRA which was applied to their required minimum distribution (RMD), and they plan to add to the fund in the future in the same manner. One of Allen's most memorable Lafayette moments recreated itself during a subsequent visit with Alfange. "I recall vividly one of Professor Alfange's classes on the 14th Amendment," explains Allen. "His use of the Socratic method ensured that the discussion would be lively and intense, but no one could understand the point he was trying to make! It has remained a mystery to me to this day. Several years later, when we were visiting colleges with our daughter, I decided to contact Alfange as he was then teaching at the University of Massachusetts. We attended one of his constitutional law classes and, low and behold, that was the topic! I was sweating bullets because I was certain he was going to call on me." After class, when Allen had asked why he not been called upon, Professor Alfange explained that he was so engrossed in the discussion, just as he had been years earlier, that he had forgotten that he had visitors seated in the back row. 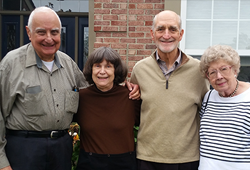 For the Allens, creating the scholarship fund to honor a dear friend through the utilization of the RMD of an IRA was a "win win." "We wanted to recognize Dean Alfange," explains Allen. "The fact that we could create this scholarship with RMD funds from the IRA and receive a tax advantage made it even more attractive."